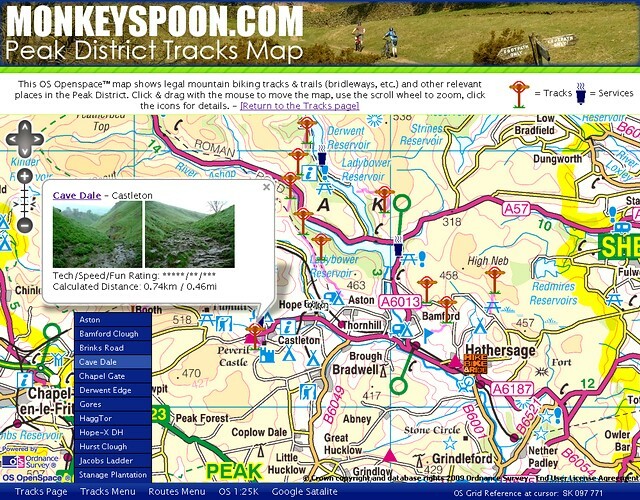 The Monkeyspoon Web Team have been hard at work to produce the OS Tracks Map, an interactive online map with information about mountain biking in the Peak District, showing the locations of all the tracks in Track pages using Ordnance Survey’s Openspace™ map system. It shows legal mountain biking tracks & trails (bridleways, etc.) and other locations useful to mountain bikers visiting the Peak District and surrounding area. We are also developing a Route Designer with pre-draw lines for amazingly fast route creation and sharing, it is currently ‘Beta’ software on a separate page (see more details below). We hope our map pages will help find good places to ride, as well as aid you in planning and sharing mountain biking routes in the Peak District. ‘Services’ locations – Places that are useful to MTBers visiting the area. Location URL shortcuts – Easy sharing of locations, Tracks, Routes or Grid References. Routes – Not many so far, more will be added. Track & Route menus – Click to go straight to a Track or Route. 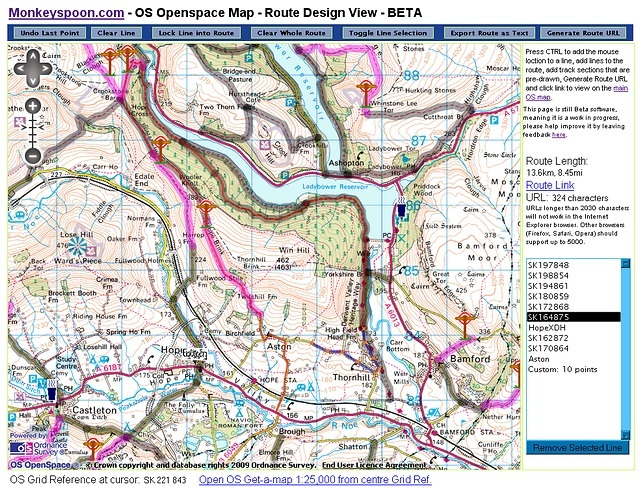 Other view links – to open the location in 1:25K OS map or Google Maps aerial views. You can operate it by using the buttons in the top left, or click and drag with your mouse to pan and use the scroll wheel to zoom (while the cursor is over the map). The menu at the bottom of the map has links to zoom and centre the map on the Tracks and Routes that can be displayed. Since the map zoom level can currently only go to 1:50,000 (1:50K), there is a link to open an OS Get-a-map(TM) 1:25,000 (1:25K) window (that’s a more detailed scale) using the Grid Reference from the centre of the map and also a Google Maps aerial view. To find out what a symbol on the OS map means click on ‘OS Legend’ to view a PDF containing the map legend (key). In the bottom right a 6-figure grid reference of cursors current (or last) position is shown. On the map are brown and red signpost symbols, these show the top of a track and a purple semi-transparent line shows the route of the track. Clicking on the symbol brings up a small info note with a link to the relevant Track page, two preview pictures and its ratings. A blue steaming cup symbol indicates Services; a location with public parking, toilets and where food & drink are normally available. Other markers (normally logos) indicate bike shops and other mountain biking facilities. In the right hand panel, under ‘Go to location’, you can enter a place name post codes (full or 1st half) or OS Grid References (6 or 8 figure), that are within the Peak District or surrounding area, then click ‘Go’ to zoom and centre the map on that location. For place names the number of place found and the name of the current place the map has zoomed to is shown below the Search box. If there is more than one found click the ‘>’ button to view the next place. In the right hand panel, under ‘Sharing’, are three links to share the current location grid reference, track or route. For the current location, centre the map on the location you wish to share, then click the ‘Centre Grid Ref’ button, this will generate the link, which you click to open or right click and copy to share it with others. The Track and Route links are generated when you click to view a Track or Route in the bottom bar menu. To make a Custom Marker click ‘Position’, found under ‘Sharing’, and then click anywhere on the map to place it, then click its icon and enter your text and optionally the URL address of an image (eg a thumbnail of one your pictures on Facebook), then click ‘Save & Close’. The information has been stored in the ‘Link’ in the sidebar, click it to view your marker in a new window, you can share this with anyone by sending them the link (by copying it from the address bar, or right click ‘Link’ and choose Copy Link Location or Copy Shortcut). If you know HTML tags you can use them in the text box for links etc. The Route Design currently in development and is available as ‘Beta’ software, here. The idea behind it is that there are, relatively speaking, few places people would ride in the Peak District (compared to walking or driving), therefore instead of people constantly having to redraw routes and parts of routes, all the bridleways and joining road could pre-drawn on the map. This makes it possible to create a very accurate route in a matter of minutes, that might take half an hour by the conventional method. To my knowledge no one else has done this for mountain biking routes. Read more in this post; OS Map Route Designer Beta – Bike routes made easy!. We’d like to add more decent Routes, so let us know if you’ve got any good ones you’d like to share. If you’ve got any suggestions for improvement or new features leave a comment below. Please note: These pages are intended to be a guide to local tracks, they have been created to the best of our knowledge at the time of writing. Whilst ever effort has been made to ensure the real-world accuracy of the information given on the maps we cannot guarantee it is free from error. You are responsible for yourself and so use any information given in these pages at your own risk. Please help to correct any mistakes you find by informing us of the mistake.